This year, Z and I are trying something new. Each day, when he reads an entire story or book (or has one read to him), we are recording it. This is partially to remind him to read books and not just to browse them. He likes to grab huge stacks from his shelves (usually with a theme -- yesterday it was all of the Eric Carle board books) and then just thumb through them. I'm not discouraging this behavior but just adding a bit more to the ritual. The other reason for the calendar is to record what he is reading at this age. Most of the titles won't be memorable 20 years from now because they are picture books that we borrowed from the library for a couple of weeks. But it will still be interesting to see if we can keep this up through the years and write down chapter books as he gets to them. I would have loved to have a list like that from my childhood! 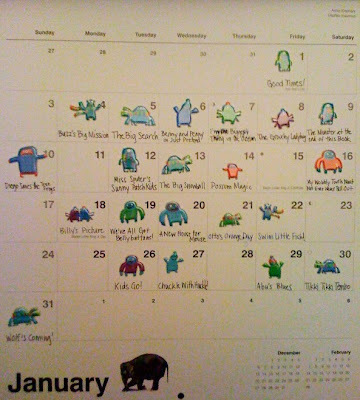 So, this year we are using the Creature 2010 Wall Calendar . Each day that we read, I write down the story name and Z puts a sticker on the date. Our record isn't perfect but I would love to show you what we've accomplished at the end of each month. Z is already getting into the pattern of this activity and choosing to read on his own more often. If you are a parent, did you or do you record what your children read? Do you see value in this activity? What a great idea! We are always needing to record reading for school and other reading programs (J.D. is currently working on one to earn a free ticket to Six Flags). It would be great to just record it every day in one place and then be able to refer to it when we need to record reading for other reasons. I think we will start something. Thanks for sharing! I think recording his reading is great. Once he gets into longer books, I think it will be really fun for him to keep track and see his reading patterns. Also, I love the stickers! Oh how cute is that little chart! And the Little One and I started something similar. We are trying to read a book every day and I'm writing down all the titles. I've been thinking of putting them on my book blog so he has an electronic copy, and I think I'll do that. I would have loved a list like this!!! I think it is a fantastic tool. Your little 'un must be very proud of himself. With my older two we made no effort reading was a snap for them. With the baby of the family we did something like this until she "got" reading. Now with her at 16 and doing what is called VCE (Victorian Certificate of Ed, a academic delight that decides University placement) we have to remind her to stop reading and go to bed. I think you have just given me an idea for a post. Thanks! Corbetts - I hope J.D. gets his ticket! There are much less productive ways to have to earn something like that! Lena - They're cute stickers, aren't they? :) Part of the fun will be choosing stickers for the year! Jenners - Awesome that you are recording things too! We are also aiming for one a day but it's hard to remember before the habit has formed. Al - I was a compulsive reader as a kid. I would hide with a flashlight under my bed at night just to read. So I figure if we get this habit going early, it could easily become standard for him too. And good luck to your baby on her test! Those are never fun but luckily they're a one-time pain. This is a very cute idea!! Love it!! Thanks, Tif! We are doing a great job this month and I can't wait to share it again.